The oil complex is flat to slightly lower across the board this morning. Oil traded up another 32 cents yesterday to close at $67.07, a three-year record high price. 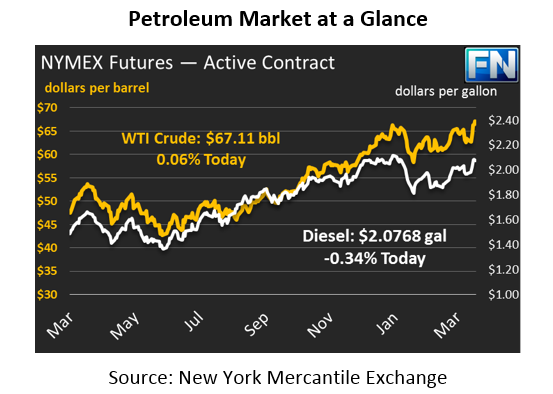 After its week of heavy gains, crude is trading mostly flat this morning – gaining 4 cents to trade at $67.11. Fuel prices are pointing down this morning continuing in yesterday’s small decline. Fuel prices followed crude in its large price hike this week, both gaining over 5%. Product prices fell yesterday, though the losses were minimal. Today, diesel is trading at $2.0768, down 70 points from Thursday’s close. Gasoline prices lost 55 points this morning to trade at $2.0491. Like crude, both products are trading within a price range not seen since 2014. The biofuel industry has received much attention lately regarding the EPA’s decision to grant 25 small refineries exemptions from the RFS 2016 and 2017 compliance obligations. Adding to the news, Thursday, President Trump announced the administration’s plan to allow the sale of E15 (a gasoline blend containing 15% ethanol) year-round. Currently, E15 cannot be sold during the summer months due to the EPA’s concern for the amount of smog a higher blend of ethanol contributes on hot days. Removing this ban would boost the demand for ethanol which would be “very exciting news” for the agriculture industry, according to Monte Shaw, the executive director of the Iowa Renewable Fuels Association. However, many refineries have been lobbying for a “cap” on the price of blending credits, stating that the Renewable Fuel Standards (RFS) are too costly to uphold. A higher percent blend of biofuels decreases the amount of refined petroleum products in the American fuel tank, which does not bode well with refiners. The White House, the Department of Agriculture and Congress will be discussing the issue before a final decision is made.